Fiji storm to Sevens victory in Singapore - SABC News - Breaking news, special reports, world, business, sport coverage of all South African current events. Africa's news leader. 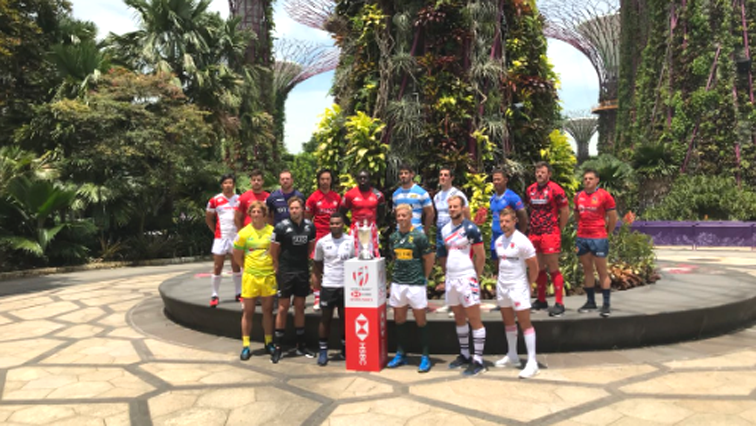 Sixteen captains all pose for the #Singapore7s. Olympic champions Fiji stormed to victory in a dramatic final at the Singapore Sevens on Sunday, narrowly edging out a captainless Australia 28-22 to go top of the circuit table. With the clock ticking in the second half, it appeared Australia — leading by one point — had the title in the bag, but they scuppered in the very last minute by the spirited Fijians. The tightly-fought match was won in the final play of extra time, with Alasio Naduvawho sprinting 95 metres across the field to score the final try. “I’m speechless. Australia are a very good side and took us to the wire. We gave everything for this final,” Fiji captain Jerry Tuwai said in a post-match interview. The Fijians may lack the high-end training facilities of their wealthier opponents, but the world-beaters are set apart by fierce team spirit and guided by their deep faith. Fiji had arrived in Singapore looking for a third consecutive Sevens victory after winning the Vancouver and Hong Kong legs of the challenge. This is their fourth victory on the circuit. After dispatching New Zealand in a blistering quarter-final — a repeat of this year’s Commonwealth Games final — the Fijians narrowly edged out South Africa 12-10 at the semifinals. Sunday’s win has also helped them displace the Blitzboks at top spot. Australian captain Jesse Parahi sat out the final after he picked up an injury during the semi-final match against England earlier in the day and had to be stretchered off the field. Second seed South Africa were dispatched by England in the bronze medal match 24-26, which saw a last-minute try by Michael Ellery. Earlier in the day, 2017 champions Canada faced the US team in a repeat of last year’s final, but were demolished this time by the Americans who were in top form. Often referred to as the “surprise Sevens”, the Singapore leg of the tournament has seen three different winners in as many editions. Usually held a week after the marquee Hong Kong Sevens, the Singapore stop has often suffered from lacklustre attendance with fans preferring Hong Kong’s party atmosphere. This entry was posted on 29 Apr 2018,07:09PM at 7:09 PM and is filed under Sport, News. You can follow any responses to this entry through the RSS 2.0 feed. Both comments and pings are currently closed.